Below are listed some interesting games and activities that explain crystallography. Click on the image to learn more about the item. 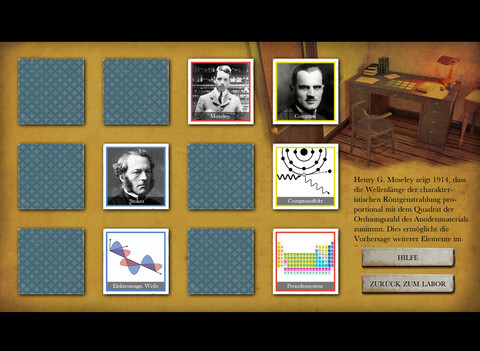 To mark the 100th anniversary of the discovery of X-ray interference in 1912 by Max von Laue, the Röntgen Museum has developed a game for the Apple iPad to explain the nature and properties of X-rays. The app "Der Fall X" can be downloaded free of charge from the Apple iTunes Shop. The game is in English and German. Nach der sensationellen Entdeckung gelang es Wilhelm Conrad Röntgen in kurzer Zeit die wichtigsten Eigenschaften der Röntgenstrahlen zu beschreiben. Seine Forschungen zu ihrer physikalischen Natur blieben jedoch erfolglos. Die Frage "Ist es Licht?" beschäftigte daraufhin eine ganze Generation von hervorragenden Wissenschaftlern. In unserem Spiel könnt ihr der Sache selber auf den Grund gehen. Dazu müsst ihr in unserem Forscherlabor den Hinweisen folgen und Informationen sammeln. Lernt dabei einige der wichtigsten Physiker des 20. Jahrhunderts und Ihre Ideen und Forschungen kennen. Stellt euch dann unserer Prüfungskommission. Nach der Beantwortung von insgesamt 12 Fragen habt ihr das Ziel erreicht und könnt euch euer "Röntgen-Diplom" ausstellen lassen. Wir wünschen viel Spaß und Erfolg beim Forschen. To commemorate the International Year of Crystallography 2014, the Universitat Autònoma de Barcelona has developed Quiztallography, a game for Android and Windows phones. The app contains more than 1000 questions, often including interactive 3D-polyhedra. The user can select two playing modes: time trial (you can set the allowed playing time) or without time (you can save your game and resume playing later). Correct answers will produce a variable number of quiz points (depending on the given question) and failed answers will result in the subtraction of one quiz point. The application will help undergraduate students to improve their skills in point-symmetry in an entertaining way. The app Quiztallography can be downloaded free of charge from the Android market (Google Play) or from the Windows Phone Store. The game is currently available in English, Catalan and Spanish.